PETERLOO featues John-Paul Hurley as John Thacker Saxton, Joseph Kloska as Richard Carlile, Victoria Moseley as Susanna Saxton, and Dorothy Duffy as Mary Fildes. ©Amazon Studios. CR: Simon Mein. But the 1819-set epic, about the clash between the military and non-landowning citizens seeking their voting rights clashing in a bloody battle, has clear echoes of the unrest occurring in European capitals and sporadically here today. The film stars Rory Kinnear as firebrand Henry Hunt who spurred the masses to rise up and demand voting rights for non-landowning citizens of England. The film also follows a working-class Manchester family who connect with the radical idea of representation for all after their soldier son returns from Britain’s defeat of Napoleon at Waterloo a changed man (these days, the young vet would have been diagnosed with PTSD). They prepare to join what they expect to be a peaceful demonstration at St. Peter’s Fields in Manchester but the gathering of men, women and children from nearby towns and villages quickly devolves into a bloody attack by overzealous soldiers. As many as 15 people were killed and more than 700 were wounded. The attack became a turning point in the voting rights crusade. 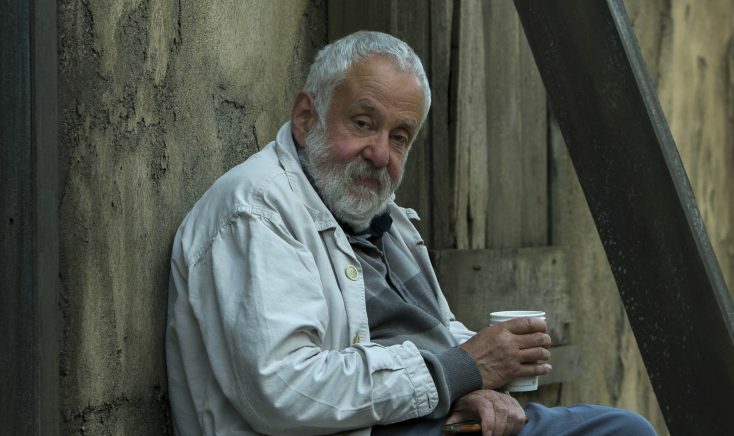 The Oscar nominee (“Topsy Turvy,” “Vera Drake,” “Mr. Turner”) was on-hand to discuss his newest film, which like most of works was unscripted but carefully rehearsed by a troupe of seasoned British actors. Q: The film is prescient with what’s going on in Europe with Brexit and the problems in France and Italy. But when you were making this, all these events weren’t going on. Leigh: We started at the beginning of 2014. Fairly swiftly, almost on a daily basis, we started saying, “This is relevant. This is increasingly relevant.” What we couldn’t have anticipated is the mayhem of what’s happened (since then). Brexit, whichever way it could happen, ideally Brexit should be canceled and forgotten about, but that’s not so straightforward. There should be another referendum. The people voted in ignorance, paranoia and xenophobia. Everyone knows if Brexit were canceled or if another referendum yielded another result, there will be riots. So, actually, it’s an insoluble situation because if we have Brexit, there will be incredible chaos, business will be affected, food and medicine deliveries will be interrupted, and it is a mess. Now, in the context of the film, the film is about democracy. It’s about the voice of the people being heard. I guess it can be argued that the people’s voice was heard. But the people’s voice also was heard in Germany in 1933. So, there’s democracy and democracy gone wrong. It’s difficult. Q: How difficult was it getting this film funded? Most Americans are unaware of this chapter of Britain’s history. Leigh: It wasn’t difficult. It just so happened by incredible good fortune that my producer and executive producer went to Cannes to start to look for money for the project and almost straight away they ran into (executives from) Amazon Studios. And they said they would (finance it) just like that. Curiously, it wasn’t a long struggle as compared with other films I’ve done, including my next film, which is a long struggle as we speak. Amazon Studios never interfered with form, casting or content. There was never an issue because of the subject matter. Q: How did you shoot the riot/massacre scene? It looks like a cast of thousands. Leigh: We had 200 extras. In reality, there were 60,000-100,000 people there. So, what you see onscreen is crowd replication. We shot the big sequence at Tilbury Fort, near the Tilbury Docks on the Southeast—as far away from Manchester as you could possibly get. Nothing was actually shot in Manchester. Tilbury Fort is a strange, bleak place. We put up that row of houses as a build. The house of magistrates were real buildings. Behind it, where there are factories and churches, that’s not there at all. What the CGI guys did was go back to maps and plans of buildings and made a virtual map of Manchester of the period and did it immaculately. It just shows you what we can now do with CGI. When we made “Topsy Turvy” 20-something years ago, there was a shot of the orchestra in the pit and in the foreground there is a guy playing the violin. By some oversight, he was wearing a modern watch. At that time, to remove it digitally, it cost us 15,000 pounds, and that was crude. But what you can do now is phenomenal. We had a taste of it in “Mr. Turner.” When they see Turner and two other painters in a rowboat across The Fighting Temeraire, a great ship that was being towed off to be broken up, that was a CGI job. The guys researched it and built it but the stuff in “Peterloo” that is infinitely better than that. It was really impressive. The film is about human beings and human activities and real things. The fact that there’s CGI in it is a technicality because, in the end, the spirit of the film is not upstaged by the technicalities. It’s deploying those techniques to make it as real as possible. Q: What are your thoughts on Henry Hunt, the radical orator who proposes these reforms? Leigh: Henry Hunt was a rich landowner who embraced the radical cause. He was an articulate orator with a great loud voice and a massive ego-centric and narcissist and not somebody I’d want to spend too much time with. Q: How did you assemble your cast? Leigh: There are 160 actors in the film. In the UK, we’re blessed with fantastic actors. You don’t need to pull in people that aren’t really the right people. Every single character in “Peterloo” who is a Northern character is played by a Northern actor and they all were fantastically brilliant. They’re all character actors, meaning they’re all motivated to play “real” people. They’re actors because they want to show life. The casting process was about digging those people out. Some of them hadn’t done movies, but they’ve been in television and on stage. Q: Do you gravitate towards theater actors? Leigh: In the UK, most serious actors do film/television/stage/and radio acting. On the whole, people who can do what I ask them to do have stage experience. Very very few haven’t. Q: What do you want audiences to take from this? Leigh: It’s a hard question to answer, because I’ve never made a film that says, “Think this.” When it ends, it leaves you in an emotional place but I don’t spell out the message. I’m loathe to, in a reductionist way, to say what people should take from this film because it’s about a lot of things. The audience should go and digest it in various ways. Q: David Moorst plays the young bugler who returns from the Battle of Waterloo with PTSD. He represents those soldiers who returned from battle with no support from their country for whom they fought. Leigh: Right. These young men didn’t have training. They’d be thrown onto the battlefield. This guy has bugling knowledge. When the battle of Waterloo was over, these guys had to find their own way back home. Q: He’s stumbling around for weeks if not months to get back to England. Leigh: Yeah. And some of them died along the way. Because, as there is with many wars, there was mass unemployment. Q: Do you have a favorite scene in the film or one that has particular significant meaning to you? Leigh: There’s a scene in the film, the night before the big day, where they’re lying in bed and Nellie (Maxine Peake) is talking about her granddaughter, where she says, “In 1900, she’ll be 85.” We put that scene together on the location about a week before my grandson was born. So, I was thinking what will it be like for him at the end of the 21st century. That’s where that came from. He’s 18 months old now and I look at him and I can only be optimistic, and then I think about what we’re doing to the planet. I’m strung between optimism and pessimism. Q: What can you say about your next project? Leigh: Nothing. I don’t talk about my next project plus I want to wait and see how much money I can get before I decide which way to go with it. Thirdly, most of my films, except “Peterloo,” “Mr. Turner” and “Topsy Turvy,” have all been films where I haven’t said what they’re going to be about with the backers. We’ve discovered the film in the process of making it. And I rather think that’s what my next film is going to be. So, sorry, for all those reasons, I don’t have an answer to your question. 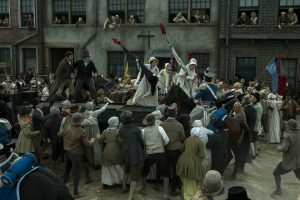 “Peterloo” opens in New York and Los Angeles Friday, April 5 and will subsequently expand in coming weeks to other markets. Previous PostPhotos: ‘Bumblebee,’ ‘Nancy Drew,’ ‘Rake’ Final Season, More on Home Entertainment … Plus a Giveaway!! !